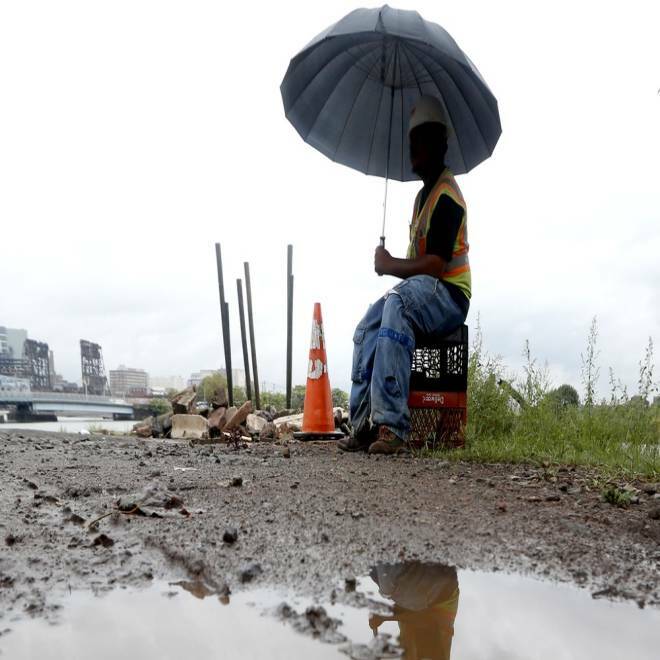 A guard shields himself from the rain at a worksite in Newark, N.J., on Tuesday. Updated at 10:30 p.m. ET: Tornado watches were issued for much of the Northeast and mid-Atlantic on Tuesday, part of a storm front that brought high winds and heavy rain. More than 50,000 lost power and air travel was disrupted across the region. Major cities within the tornado watches included New York, Philadelphia and Washington, D.C. The watches also cover parts of Connecticut, Delaware, Maryland, Massachusetts, New Jersey, New York, North Carolina, Pennsylvania, Virginia and West Virginia. Wind gusts up to 70 mph are possible in those areas, the National Weather Service said in issuing the watches, some of which run through 11 p.m. ET. Airport travel was disrupted by winds throughout the day across the Northeast and mid-Atlantic, the FAA said on its flight delay website. In Wildwood, N.J., wind gusts ripped the facade off a store, NBCNewYork.com reported. In Ridgewood, N.J., winds toppled a tree onto the roof of a home. No injuries were reported in either incident. Some 4,000 homes and businesses lost power on Long Island, the NBC station added. In Connecticut, 15,000 customers had lost power, NBCConnecticut.com reported. Localized flooding is also a danger from parts of the Appalachians into the Northeast, weather.com reported. Some 28,000 homes and businesses lost power Tuesday afternoon in the Washington and Baltimore areas, NBCWashington.com noted. In Pennsylvania, about 24,000 power customers lost power, NBCPhiladelphia.com reported. The weather looks better Wednesday into the remainder of the week, with highs in the low-to-mid 70s through Friday and partly or mostly sunny skies. The same system on Monday caused flooding in parts of Tennessee. More than 5 inches of rain fell in Putnam County, where 8 water rescues were reported.